If you heard about Egyptian myth. 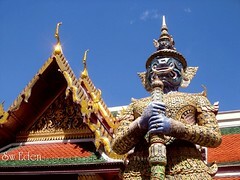 They have Anubis for protect, and right now, you see Thailand has Giant to protect the door way. Thailand has a lot of stories and great literature about Giant. If you want to know, please tell me. It is so long to write out all things. So I will not write about it, if no one want to know.